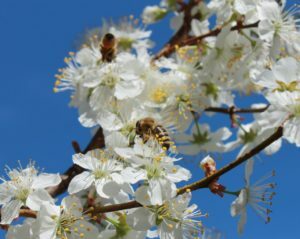 Honeybees forage on apple blossoms on a Buncombe County farm. Join Buncombe County Beekeepers Club in learning about the fascinating world of beekeeping! This popular annual event takes place at Warren Wilson College on February 16 and 17, 2019 – register today, as this event frequently sells out. This is an intensive two-day event that will expose new beekeepers to the skills they should develop in their first year of beekeeping. The content and course material is a newly designed format that received rave reviews in 2018. This course concentrates on what all new beekeepers should learn their first year in order to support a honeybee colony through its first season in their own apiary.